My first welcome message since the overhaul and rebranding of CSR Bookshelf into the CSR Learner’s Corner was released last 6 February 2015. Today, I’m writing my first editorial since the said transition, and it’s something I’ve been wanting to write about for some time now. So the first big event we’ve had in the Philippines this year is also one that the world will never forget: the State and Pastoral Visit of His Holiness Pope Francis to the Philippines. The trip was the second and final leg of a two-part Asian tour that commenced in Sri Lanka. The first papal visit since the now-St. John Paul II’s since 1995, Pope Francis came here as a self-admittedly belated response to Typhoon Haiyan (Yolanda) victims (as such, part of his state visit included visiting Tacloban, where he also attended the opening ceremony of the Pope Francis Center for the Poor), and he also spoke with families and the youth, and gave what became the largest papal gathering in history (6 million people) at the Rizal Park. Very fittingly, the theme was “Mercy and Compassion” (Habag at Malasakit), which obviously the Pope and the Church embodied for the Philippines. However, in his messages in the country, the Pope’s vision of true mercy and compassion went much further – and this is what moves me most about him. Reaching out to the less fortunate is certainly the central theme of his papacy. His regnal name, Francis, comes not from St. Francis Xavier (the Pope is Jesuit, as was Xavier), but from St. Francis of Assisi, known for being the patron saint of the poor, as a fellow cardinal congratulating him whispered to him not to forget the poor. During his visit to the Philippines, the Pope certainly went out of his way to tend to his Filipino flock, frequently getting down to bless children and embrace them, among others, more concerned for his people than for himself. And, practicing true humility, the Pope always asks everyone to pray for him, perhaps for the Lord to grant him the wisdom to be His effective and efficient servant. In fact, the Pope’s impromptu message to the youth at the University of Santo Tomas last 18 January 2015 perfectly summed up the entire message of his visit – and his papacy – and this is why it’s my favorite of his messages during his visit. Inspired by a former street child he hugged who asked him why God allows evil things to happen to children, the Pope instead delivered an impromptu speech. The question the girl asked was one of the key points, indeed, of the speech: Why do children suffer? Pope Francis said that first and foremost, we must learn how to weep if we want to even begin understanding this question. “Worldly compassion”, or unsustainable monetary give-and-move-on charity, is useless, and definitely not what Jesus did when He walked the earth. Only with weeping eyes can our vision be cleaned and we can truly see, as the Fox in The Little Prince said, the invisible, the essential. This actually sums up the entire theme of the visit, “Mercy and Compassion”. To weep is to show true compassion, to sympathize with the plight of the less fortunate, to devote ourselves not just financially but also emotionally and whole-heartedly. To act on this is to show true mercy. It is not a falsehood or an exaggeration that, given the circumstances, people want to help others. But notice what I said: given the circumstances. People may say they do not have enough: Enough money to give. Enough time to spend. But “given other circumstances”, they would. I know someone who believes that social enterprise is just a marketing strategy in which companies’ social efforts attract consumers who believe that in availing of their products, they get to help out of their busy lives. But this is exactly the kind of compassion that the Pope speaks out against, worldly compassion. They buy things, donate inadvertently to charity, and move on. For some – as we cannot and should not judge – it may be sincere but misguided or still-burgeoning attempts to reach out to the less fortunate. For others, they do it to feel good about themselves. But this is not true compassion, and not being Christlike and serving God. And don’t forget that the Pope is a Jesuit. Not to show any bias, as I have been Jesuit-educated my whole life, but there’s something about the Jesuit way of things that moves me to glorify God the most. The Jesuits take working for social justice very seriously, and in fact trains their disciples and followers to become people for others, doing so only for the greater glory of God. It is no coincidence in today’s age that God placed a Jesuit on the Holy See – for it is the ripest time to, as the Pope John Paul II Philippine visit anthem says, “tell the world of [God’s] love”. From this Jesuit devotee’s perspective, Pope Francis exemplifies living out one’s CSR. Being Pope, he believes in and loves a higher being, God, who influences him to do daily things with ethical conduct. Being a Christian leader, he teaches about charity and philanthropy – the Christian way. He essentially preaches on practicing personal good governance. And through Mercy and Compassion, he is calling us to do purposeful volunteerism in any way we can, using the unique gifts God gave each and every one of us. It is not all about donating money. It is of donating yourself, pledging yourself integrally to follow Christ and His examples. As we remember the passion, death, and resurrection of Our Lord Jesus Christ this entire March and the first week of April, let us remember to follow Pope Francis’s teachings and examples. Let us enter into our own “deaths”, death in rejection of sin and worldliness, and embrace a new life of godliness and of true love. Click here to visit the CSR Learner’s Corner feature on the Pope Francis visit. Tags: Christianity, community, compassion, CSR Bookshelf, CSR Learner's Corner, editorial, management, mercy, Pope Francis, reflections, WikiCSR. Bookmark the permalink. 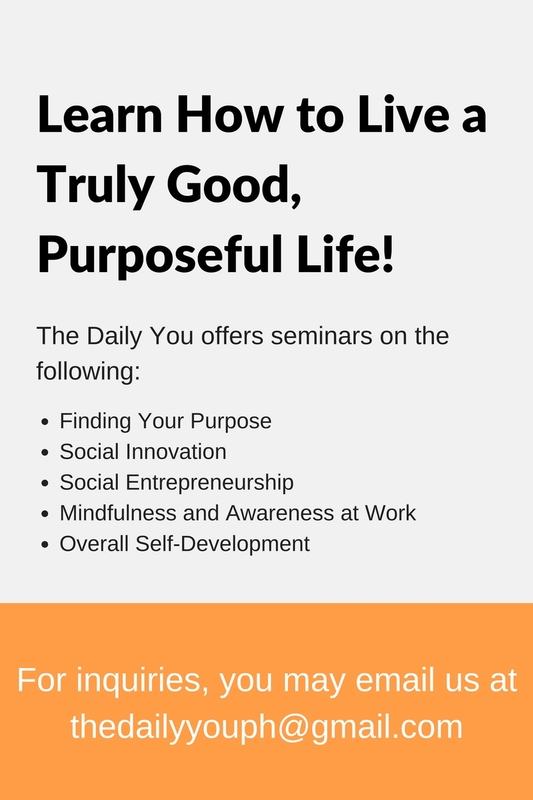 Enter your email address to join the TDY community and receive notifications of new posts by email.